I always feel excited and anxious the night before the trip. But the anxiety and excitement is so balanced that it feels good. You know the feeling of butterflies in your stomach? But this time for some reason, I felt more anxious than excited. I came back late last night after buying shoes and warm clothes, half prepared my bag and slept. Alarm was set to 5 but I woke up at 6:30. Packed bag, ate breakfast and left at 8:30. Took tram 26 to Central Station and Sprinter from there to airport and I was at airport at 9:30. Checked in and talked briefly to a Dutch couple who were also flying somewhere in North of Norway. Flight was 45 minutes late. I boarded on plane and didn’t had conversation with passenger next to me. As plane flew over Norway, I could see mountain, bays and lake. 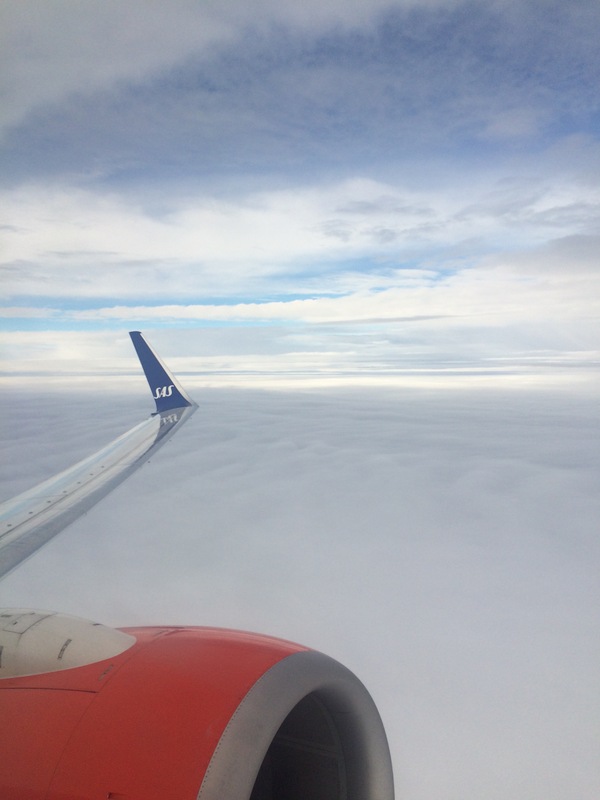 As we approached Oslo, it became extremely cloudy. By the time I landed at Oslo I had only 20 minutes before my connection flight flies. I ran and reached the gate. I turned out that flight to Tromso was also delayed. I sat in the waiting lounge next to a woman from Tromso. I talked to her and told her that I am going there to see the Aurora. She told me a few things about Tromso but that’s it. I felt like I was forcing conversation on her so I decided to quit and put on my headphones. I got the idea that people here are not up for chat. Anyway, plane arrived and I boarded, again ended up sitting next to a middle-aged couple who were from Oslo but flying to Tromso for some training session. They were chatty and have their stories to tell and wanted to listen mine. We talked for an hour about travel, weather and several other things. After that, I decided to take a nap and slept in plane. Woke up after sometime and look outside and guess what? Clouds! 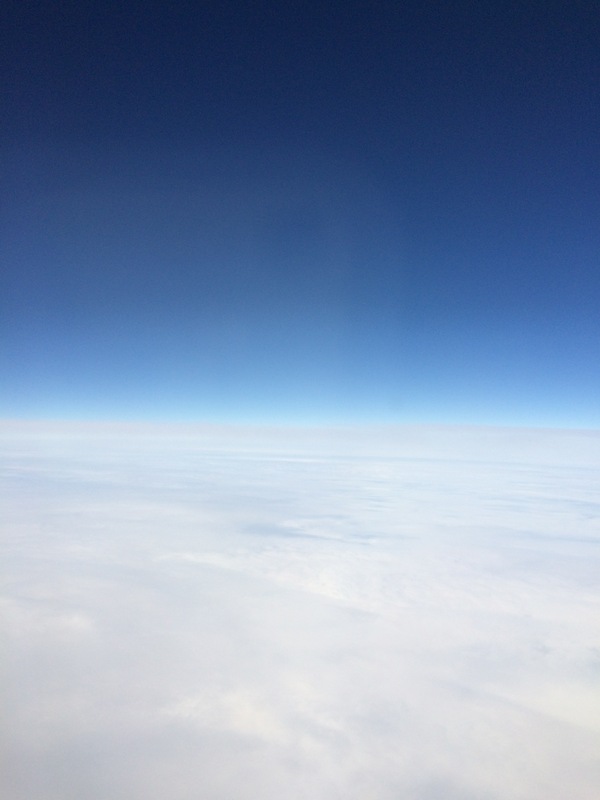 For 30 minutes, we flew through clouds and landed with a bit of turbulence. It was raining like crazy. My plan was to go to city and roam around until my host pick me up. But looking at the rain, I decided to stay in Airport for 2 hours. I saw a guy in lounge who looked like traveler so I decided to chat up with him. He was waiting for his connection flight and he was coming for Svalbard Islands, huge respect :). He was a guru of finding cheap flights, he shared several websites and tricks with me. We chatted for an hour and then I got a message from my host that she is out at Airport parking. I said bye to Matt and went outside and found my host. She drove me to the apartment and I witnessed rain all the way, I felt disappointed. After checking in into apartment, I asked my host about the options to eat. Before I go ahead, let me tell you where I was staying. Kvaløysletta, an Island 20 Kms west of Tromso. There were 3 options to eat outside. A supermarket that has a cafe, a Thai place and a Pizza parlour. Since it was raining, I decided to go to the nearest one which was the supermarket/cafe. I walked there in rain for almost 20 minutes, most of the times unsure if I was headed in right direction. I couldn’t use google maps as it was raining and if I were to take out my phone, it would get wet in seconds. After 20 minutes, I was in the cafe. I asked what were the options, guess what? Not much. Just some fish and roasted chicken. I didn’t enjoy it at all because it was overcooked and not tasty at all. Walking alone in dark and cold that night, I came to understand the meaning of that quote.